To immerse yourself in the Upper City of Bergamo , in Italy, is to move to another era, and among its many attractions today we stop at a place not too well known to visitors, perhaps overshadowed by other treasures we find in the city. 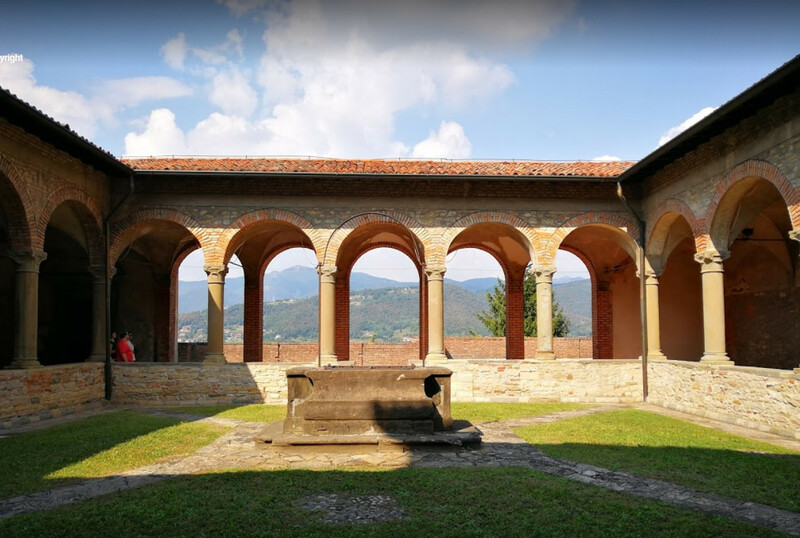 Near the heart of Città Alta it is possible to visit an outstanding example of medieval convent architecture: the Convent of San Francesco , with a cloister that invites you to rest and admire the views between two valleys and mountains from this elevated point. Among the medieval towers of Bergamo, symbols of power and defense, stands this religious symbol, an imprint of the Franciscan order, with origins in the thirteenth century, very close to Piazza Mercato del Fieno. Formerly it was a major architectural complex, which included a church, and today its simplicity, fruit of the passage of centuries, is part of its charm. A tour of its two cloisters, the “delle Arche” cloister and the Clozzo del Pozzo, next to the chapter house reveals the past of the building thanks to its cycle of frescoes made between the 14th and 17th centuries . A monastery that was also prison and school and that is connected to an old fortress through the mysterious “scale of the condemned”. The Cloister of the Arcas is the largest, built between 1455 and 1500, used in the fourteenth century as a cemetery, and was called “archae” because, in fact, it contained funeral coffers of families of the city and, for this reason, also It was called “cloister of the dead”. From the same period the construction of the dormitories, the infirmary and the refectory of the monastery. From the Claustro delle Arche, a short and gentle slope leads to the smaller cloister called del Pozzo due to the large cistern that is located in its center. The walls of the cloister were adorned with frescoes from the 14th century that were lost when they were replaced in the 18th century by others representing the miracles of San Francisco. From the panoramic terrace, in the place of a third cloister, the landscape of the encounter between the two valleys of Bergamo , the Brembana valley and the Seriana valley awaits us, a mountainous environment that can be seen in all its splendor on clear days. Of the church, destroyed in 1821 to make room for a prison, there are only the apse and the three side chapels that preserve fragments of frescoes of great artistic and historical value, a precious evidence of the art of Bergamo of the fourteenth century. The frescoes that we can see in the monastery of San Francesco de Bergamohave survived the passage of time and abandonment, witnesses of a mature art completely inserted in the Lombard medieval artistic current. Sample of medieval religiosity, with scenes of saints, madonnas, the crucifixion … the frescoes are attributed to names that are lost in time: Maestro dell’Albero della Vita, il Maestro della Cappella Bonghi, Maestro degli Anacoreti or Maestro dell ‘Adorazione dei Magi. With uniformity of features and styles, subdued colors, fineness of the stroke in movement, similar scenographic apparatus … perhaps they are the work of one hand? The building is currently the archives and library of the Museo delle Storie di Bergamo, and usually hosts temporary exhibitions dedicated to the 20th century and historical photography. The Convent opens from October to May from Tuesday to Sunday from 9:30 a.m. to 1:00 p.m. and from 2:30 p.m. to 6:00 p.m. from June to September, the schedule is from Tuesday to Friday from 10 am to 1 pm and from 2:30 pm to 6 pm; Saturdays and holidays from 10 a.m. to 7 p.m. The Convent of San Francesco in Bergamo is part of the Museo delle storie di Bergamo and your visit is free . I recommend you make a stop at this historic place and check the agenda for exhibitions or other activities scheduled in this special environment.